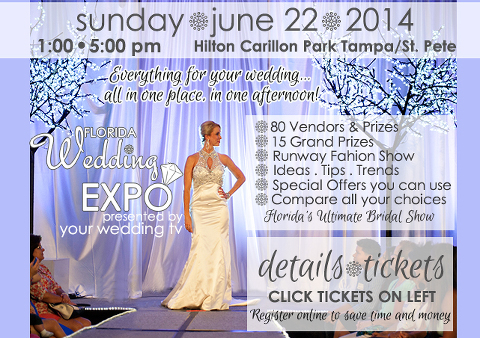 Attend one of the largest bridal shows in St. Petersburg, FL at the Florida Wedding Expo bridal show on Sunday, June 22 , 2014 at the Hilton Carillon Park Hotel – St. Pete. Join hundreds of St. Pete brides and meet over 80 St. Pete wedding vendors. The Tampa Bay bridal show runs from 1 p.m. – 5 p.m., and the first 50 brides will receive a free t-shirt! Hint: The prize drawings are toward the end, and you normally have to be present to win, so make plans to stay until the end. For more St. Pete bridal show tips, read this great advice article: Maximizing Your Tampa Bridal Show Experience. Register online for discounted bridal show tickets, $7.50 per person or pay at the door $12.00.